Andy Green is "the fastest man on earth." He set the world's first and only supersonic land speed record at an astonishing 763 mph. 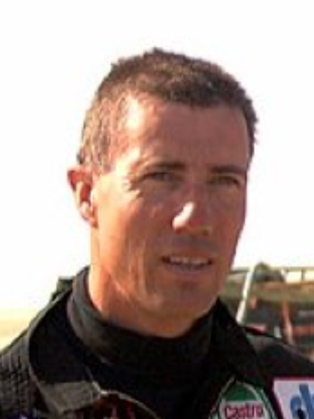 Andy is a Royal Air Force fighter pilot and as the holder of the World Land Speed Record, is "The Fastest Man on Earth. ", Driving Richard Noble's Thrust SSC in 1997, Andy set the world's first and only supersonic land speed record at an astonishing 763 mph. He went on to drive the JCB DIESELMAX car in 2006. He and the team overcame some difficult and equally challenging problems to smash the diesel record, setting the new mark at a remarkable 350 mph. Andy is now the chosen driver for the new BLOODHOUND SuperSonic Car, which aims to exceed the incredible target of 1000 mph. Wing Commander Andy Green OBE is a Royal Air Force fighter pilot and, as the holder of the World Land Speed Record, is ‘The Fastest Man on Earth’. Driving Richard Noble’s Thrust SSC (SuperSonic Car) in 1997, Andy set the world’s first and only supersonic land speed record at an astonishing 763 mph, driving literally ‘faster than a speeding bullet’. To hear of the huge technological, practical and personal challenges that he and the team had to overcome in pursuit of the ultimate Land Speed Record is to share in a story that you will not quickly forget. After setting the outright Land Speed Record in 1997 he was awarded an OBE and went on to drive the JCB DIESELMAX car in 2006. He and the team overcame some very difficult and equally challenging problems to smash the diesel record, setting the new mark at a remarkable 350 mph for the world’s fastest diesel car. Andy is now not only the only man in history to have driven supersonic, but also the only man ever to hold outright records in 2 such different classes of vehicle. Not content with these records, Andy is now the chosen driver for the new BLOODHOUND SuperSonic Car, which aims to exceed the incredible target of 1000 mph! This project, linked through a major education programme into schools across the country, aims to inspire the next generation of young engineers and scientists, while setting the most remarkable Land Speed Record of all time.